Welcome to St. John! The Church's Ministry strives to encourage worship, learning, and sharing to create a true Christian environment of Love for its members and community. Sunday worship: 10:00 AM; Visitors always welcome! 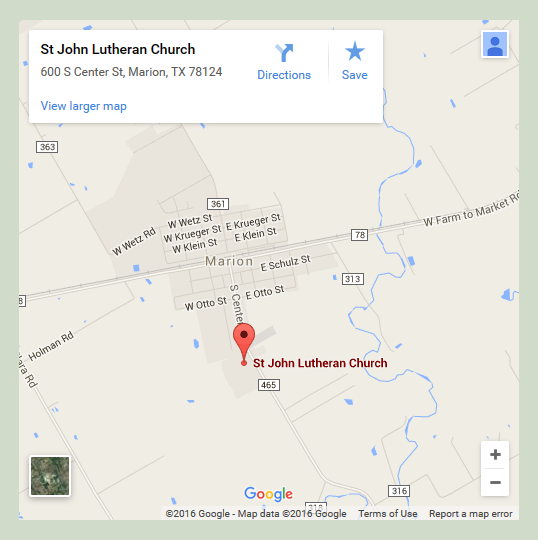 April 13, Maundy Thursday- 7:00 p.m.
April 14, Good Friday- 7:00 p.m.
St. John Lutheran Church is located in Marion, Texas, half a mile south of downtown on Center Street. 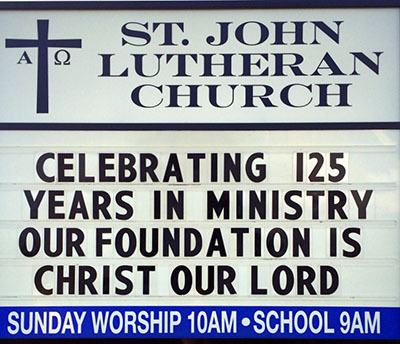 banner img="http://stjohnmarion.org/wp-content/uploads/2016/07/map.png" banner_link="http://stjohnmarion.org/contact/" title="location" text="St. John Lutheran Church is located in Marion, Texas, half a mile south of downtown on Center Street.